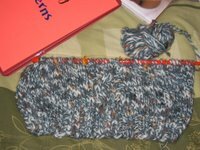 I have been quite the busy knitter over the last few days. 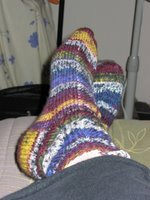 I finished my socks this evening. I really liked the way they turned out. I bet they will be even greater once they take a trip in the washing machine. I adapted a pattern I found on Knitty (you can find the pattern here). Now it's on to knitting more socks! 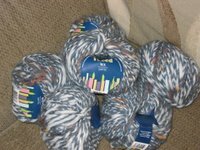 The other day I got some yarn in the mail. . . . .
And so far it has turned into this. . . . It's one side of the vest I am knitting for Peter. I could have had way more done but I was busy knitting socks for myself! :) I am hoping to have the vest done by November 4th. That's a couple weeks away but I don't want to try to kill myself to get it done. I have things to do. Like perfect my Crazy Cat Lady Halloween costume and get ready for some Halloween goodness this weekend. 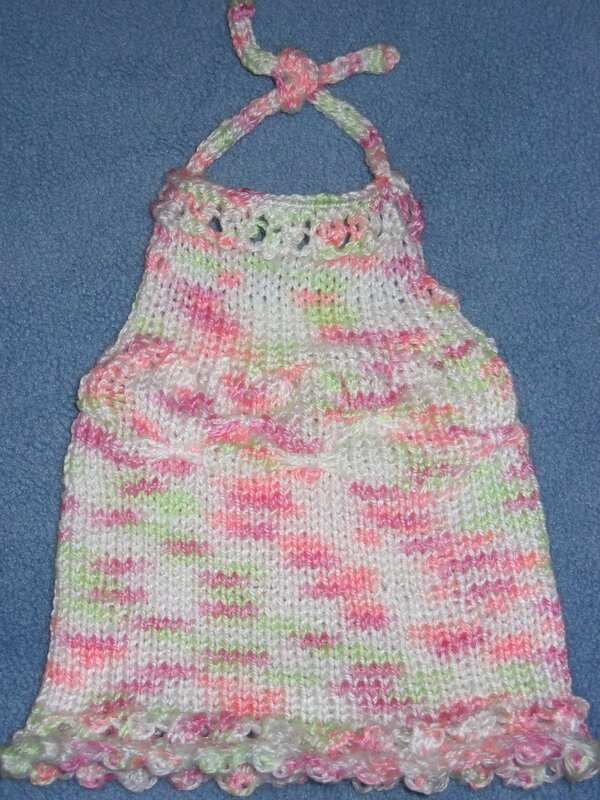 I have finished some American Girl Doll clothes over the last couple of days. 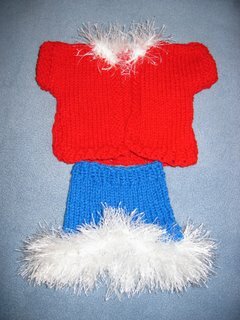 This hot red and blue number I got out of one of my Creative Knitting magazines (July 2006). I made the sweater more of a cardigan because I figured that would make it easier for a four and a half year old to get it on her expensive doll. I knit it up in just a couple of days and I am pleased with it. I also knit a couple other outfits. These patterns I found on the internet for free. The little halter dress I changed the stitches up morstly beacuse I was kind of bored with the pattern and I had just seen on Knitty Gritty a pattern with butterfly stitch and I wanted to try it. So, I threw it in the middle of the dress. It's a little weird, probably would look way better if the whole dress was that stitch rather than just a few rows, but I don't think the American Girl Doll will c omplain. 1) Socks! I really am in the mood for some sock knitting. 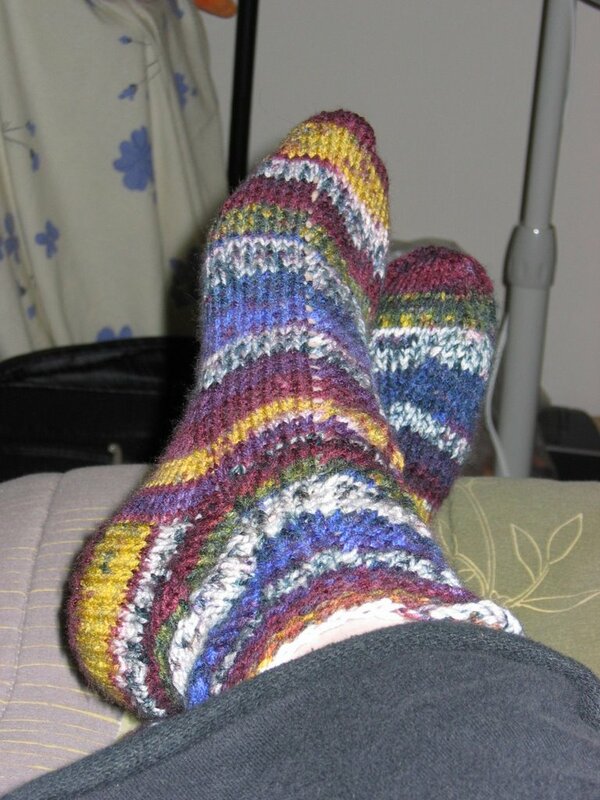 I have not knit a pair in a long time. Pictures soon! b) Vest! Lily's brother, Peter, is patiently waiting a knitted vest. He asked me to kni t him something long ago and this Christmas he will finally get something. So, he is getting a vest. We talked about it. He likes the idea. He wants an army man or knight knitted on the front and I had to tell him I don't do that kind of thing. He is getting your plain, run of the mill, cable vest. I know he will like it. 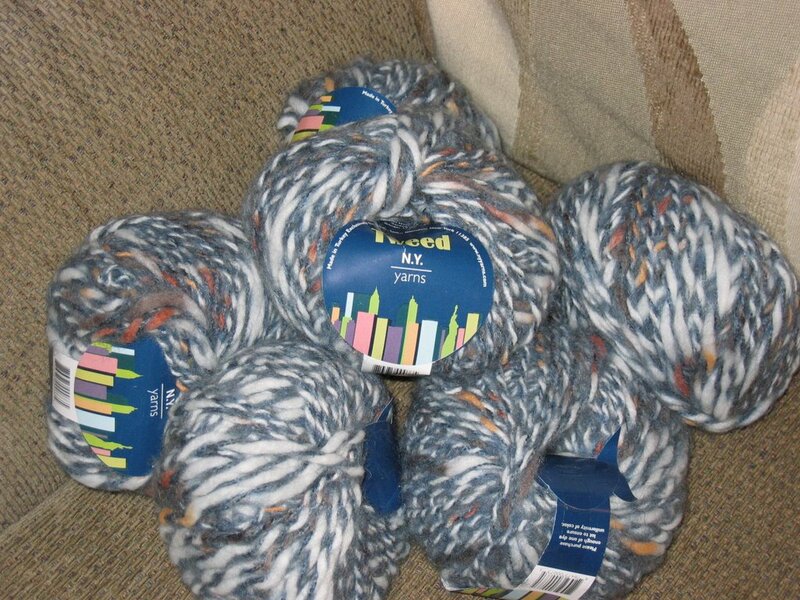 The yarn for that came in the mail today so I will be starting on that tonight or tomorrow. 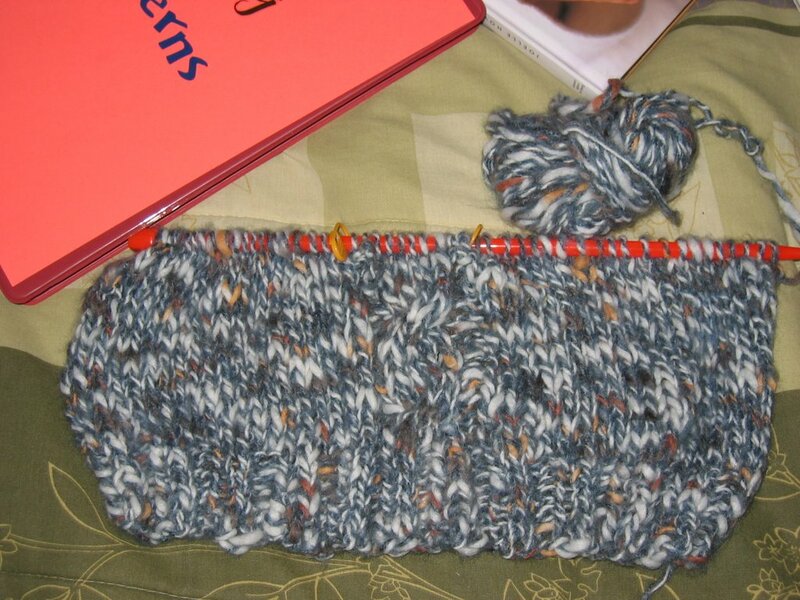 And, back to knitting. . . . (and watching bad MTV). Who said that? Well, here are the coasters that I knit on Sunday. I quite enjoy them. I saw them on an episode of Knitty Gritty on DIY a couple of weeks ago and thought "Hey, I think I can knit that." Some leftover yarn and a couple hours later I had my set of four coasters. I think my friend Claire will enjoy them...they will match her kitchen. I used yarn I already had, which is always a good thing because a) I use up yarn I am tired of looking at and 2) I will soon have room for more yarn, which really is the key factor in this equation. You can find the pattern for these coasters here. I used some cheap 100% acrylic yarn that I had in my stash (I used TLC Essentials, Worsted Weight yarn in two different colors: 2672 Lt Thyme and 2916 Island). I am quite pleased with the result. 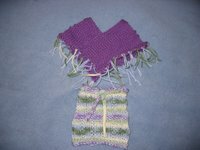 I definitely will be knitting up some more of these for C hristmas gifts. Ah, the Christmas knitting. Will it ever end? I also knit a couple of wine cozy as part of my let's use up some yarn and get some Christmas knitting done at the same time plan. 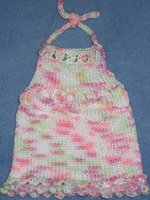 I found this pattern on Knitty.com. 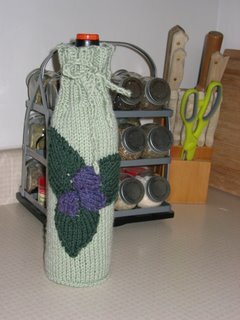 You can find the pattern for this wine cozy here. I really really like the way it turned out. I more than like it, I love it. I know that I am going to have no choice but to knit one for myself! Hmm, in other news, my sister, Melissa, thinks my knitting blog is out of control (and not in a good way). I think she is off her rocker. I think it's smart. I knit a lot of stuff and then give it away, and I think it's nice to remember what I have knit. Just wait, in a year she will have her own knitting blog and then she will want to be my knitting blog friend! And with that, it is back to knitting. I am working on some American Girl doll clothes for a little girl who is going to be getting one of these dolls for Christmas this year. I find patterns for these dolls to be few and far between in the land of free patterns on the internet, but I like what I have and I think everything will turn out nicely. We will see. . . .
A New Blog. . . . Anyway, that's it. 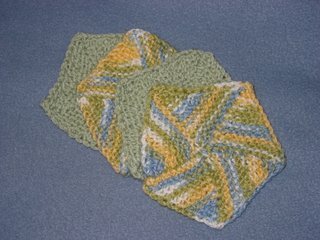 More later on the fabulous coasters I knit yesterday. I want to keep them for myself.